The Jura F8 is, like all automatic coffee machines, a bean to cup fresh milk machine. The F8 is designed for small to medium sized offices of up to about 25 people and is our most popular automatic coffee machine. Its small size means it enables one to make a great cup of coffee at a very reasonable price, as coffee machine prices increase exponentially with increasing machine size. Milk Froth Quality – The froth on all Jura Automatic machines from mid 2014 utilises the new fine foam frothing technology which means that the milk froth for cappuccinos and lattes comes out thick and creamy. This is still one feature which separates Jura machines from most other entry level automatic machines on the market today. Relatively Low Priced – Although the Jura F8 is not entry-level-priced automatic machine, it is still one of the cheaper Jura models. Two Touch Cappuccino – The F8 is a “two-touch” cappuccino machine. This means that one has to perform two actions when making themselves a cappuccino. This process adds on an extra 5 seconds and can be tricky for first time users. This isn’t usually an issue in office based environments but can be a challenge in environments where one wants to cater for a large number of first time users like car showrooms, boardrooms and reception areas. 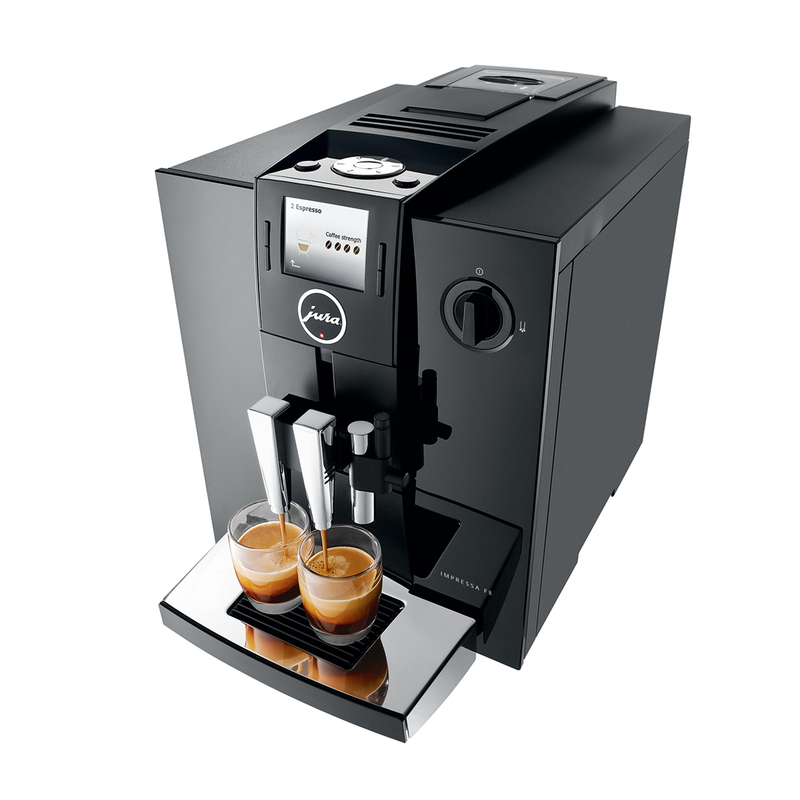 There are Cheaper Models Out There – Although the Jura F8 is one of the cheaper Jura coffee machines, there are a number of other brands on the market which are still cheaper than the Jura F8. These other brands might not have the same frothing and extraction quality but the features are almost identical. If you are a first time drinker and not too fussy with your coffee quality then another brand might be a better option for you. Noise – The F8 does have a few features to eliminate noise as much as possible however when grinding beans there is still some latent noise which can be heard. Water Tank Size – The F8 has a 1.9 litre water tank which can make around 15 cups between fills (cappuccinos). The machine is ready to go immediately once the tank is refilled however it still does need to be refilled.